Master of evil, enemy of the good, great shark swimming in the international troubled waters, he has found in Tintin the "ideal fussbudget" who keeps irritating him. Working in the movie industry at first, he veered into traffic of influence and narcotics. Great Master of an occult organisation whose ramifications cover the planet. Rastapopoulos is already present in Tintin in America. Indeed, conforming to the protocol, he stands on Tintin's left side during the gala soirée celebrating the outcome of our hero's American adventures. 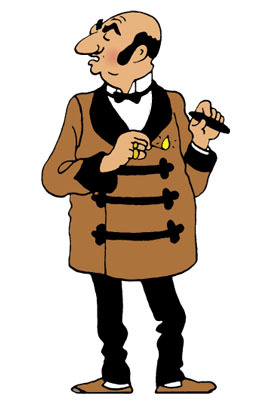 In Cigars of the Pharaoh, Tintin will cross paths with him, on the cruise liner taking them both to Port Said. The billionaire, director of the famous movie company, Cosmos Pictures, is going to Arabia, via Egypt, to supervise the shooting of one of his new super productions. In reality, Rastapopoulos is the head, the Great Master, of a powerful organisation trafficking opium. His felony will be eventually revealed in i>The Blue Lotus. Genius of evil gifted without doubt, an evil genius, with an uncommon way of handling people, he reappears in The Red Sea Sharks under the stage name of Marquis di Gorgonzola, the owner of, among others, Arabair which is involved in slave trafficking. Finally, in Flight 714 for Sydney, the man has lost a bit of his haughtiness and his role becomes quite pathetic. The terrible villain who enjoyed the jete set lifestyles has turned into a pitiful adventurer. He is quite ridiculous. At different stages, the scoundrel can be seen dressed in such diverse clothing as a cowboy outfit, a theatre costume, a tuxedo, a rather flashy suit and an elegant outfit. ooh!!! love him!!!! i love rastapopoulos sooo much! hes so funny and evil at the same time and i love his outfits!